UPDATE: H/T to Erin Arlinghaus who observed that in some states there are legal restrictions on collecting rainwater. You can read a relatively recent summary of the state of the raw-water union here. Now friends, you who don’t live in a “Raw Water State” might be glancing enviously towards those of us who do. You might be thinking, “Perhaps I should move to some ‘better’ state where people are allowed to just set out their water cooler under the eaves and gather all the hurricane water they need for flushing that toilet even if the floods break the mains. You, the earnest raw-water enthusiast, envision the other states as some kind of survivalist paradise. If only you lived in a Raw Water State, everything would be so much better, you say! States where residents are allowed to collect their own water are terrible places. Put that thought out of your mind right now! Surely if you traveled to such a state, you would be immediately molested by the lawless beasts who inhabit such wild lands. No, my dear Raw Water Aficionado. We must not allow that to happen to you. Stay right where you are. After all, can you put a price on human rights? When we think about how precious “raw water” is, surely $15/gallon, or even double that, is not too high a price to pay! Stay right where you are. Do not, repeat: do not, even think of moving to a state where the rain falls from the sky for free. Many dangers that way lie, and you must do the right thing and stay someplace civilized where all your viral, bacterial, and amoebic needs can be met in the safety of the whole-foods grocery store. Well trendsetters, I’m gonna let you in on a little secret: It is not necessary to pay $15/gallon for untreated drinking water. It literally — get this — falls from the sky. Right now, if you live on the East Coast it’s probably falling from the sky into your yard, in an easily collectible crystalline structure that automatically converts into a liquid when stored at room temperature. In warmer weather, you’ll need to put out an open-topped, “watertight” vessel when it “rains.” You may have heard of rain. That’s God’s way of sending you free raw water. Now not everyone owns a vessel for collecting water from the sky (though you should), or perhaps you forgot to put yours out when the free water was falling from the sky in your area. In that case, you can collect raw water from naturally-forming raw water collection points called ponds, lakes, streams, creeks, and rivers. These fascinating geologic formations can be found across the entire United States and most foreign countries. Once you’ve collected your raw water absolutely free, here are some great tips from the EPA on how to make that water potable. Do it right! Don’t let the protozoa win! 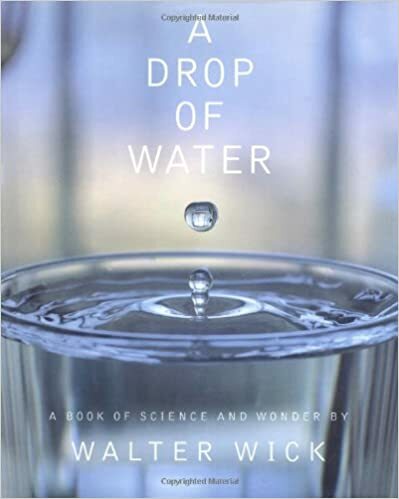 And for doing science experiments with your water, you’ll want A Drop of Water by Walter Wick, available at any self-respecting public library. Cover art courtesy of Amazon.com.